Call 214-564-1407 to place an order. Renew any lampshade with a unique vintage look. The DejaNew lampshade cover slips easily over most lampshades up to 13" (top to bottom). 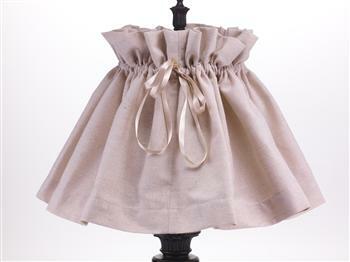 Position cover onto lampshade, pull the ribbon and tie to secure. DejaNew lampshade covers come in two fabrics as shown. 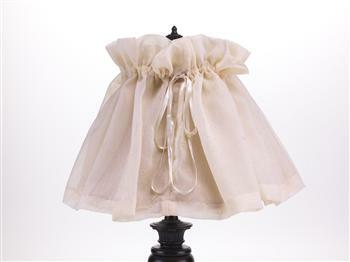 Cream Crushed Voile - Made of light filtering 100% polyester crushed voile (same fabric as shown on our vintage pillows). Tie is 100% polyester double-faced satin. Machine wash cool, delicate and line dry. Intended use is over a lampshade. It is not intended to replace a lampshade. Adjustable 50" x 13 1/2" to fit lampshades up to 13" (top to bottom). 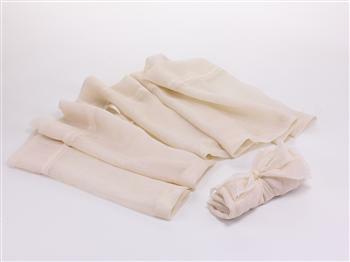 Packaged as a rolled package tied with a bow and fabric information and washing instructions. 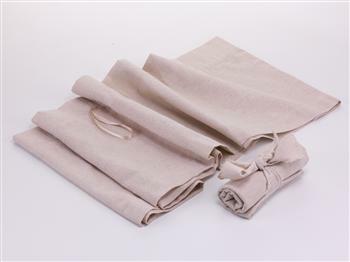 100% Unbleached Cotton Muslin - Made of light filtering 100% cotton muslin. Tie is 100% polyester double-faced satin. Machine wash cool, delicate, line dry, cool iron. Intended use is over a lampshade. It is not intended to replace a lampshade. Adjustable 38" x 13" to fit lampshades up to 13" (top to bottom).